(Photo: © Peter Kenny / Ecumenical News)Rev. Ibrahim Yusuf Wushishi at the Ecumenical Centre in Geneva, Switzerland on Sept. 29, 2015. For a key Nigerian churches' leader from the country's troubled north ecumenical relations have to include interfaith cooperation in a nation where Christians and Muslims are almost equal numerically. "Christianity is not about big preaching, it's about how you can impact somebody and add value," says Nigerian ecumenical leader Rev. Ibrahim Yusuf Wushishi. 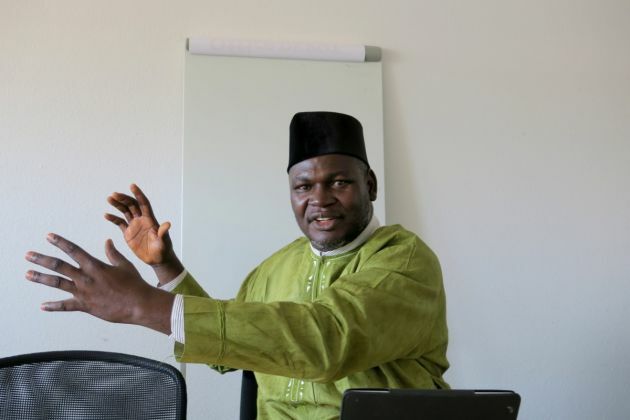 Wushishi, is the first general secretary of the Christian Council in Nigeria from the mainly Muslim northern part of Africa's most populous nation and visited the World Council of Churches at Geneva's Ecumenical Centre in late September and early October. While he was in Switzerland he met with Christian and Muslim groups who signed an agreement for a plan to work together at a new inter-religious center working for healing and reconciliation in Nigeria set to launch in March 2016. From Nigeria's northwest, Wushishi was recommended to lead the CCN by the Baptist Convention with effect from October 2010, at a time when the "council was going through some serious challenges". The council was started in 1929, bringing together Anglican and Protestant churches, and its combined membership includes some 40 million people. "Since 1929 the CCN has never had a general secretary from the north of Nigeria. I was the first, and among all the heads of churches, there has never been a northerner," says Wushishi who spoke about life in Nigeria under a new president. Before 2003, Wushishi had never been on an airplane, let alone outside his country; then, he gained a WCC scholarship to study in Ireland, a turning point in his life. "It was then that I realized I have to go home to start something," says the CCN leader. He does not mince his words about how Nigeria has been ruled, noting, "The political class don't feel the pains of the people," adding, "can you imagine a rich country that is full of poor people?" The type of inter-religious insecurity that now plagues Nigeria was not around when Wushishi was young. "Most of my fellow pupils in my class at school were Muslims," he says. Nigeria has a population of around 180 million according to UN estimates, with about 90 percent of the population either Christians or Muslims, almost evenly divided. But increasing tensions arose with sectarian tensions brought about by the introduction of Muslim Sharia law in some northern states after 2000. Then the rise of terror group Boko Haram, that detests modern education and initially targeted primarily Christians and now targets Muslims as well, created confrontation and turmoil claiming to create mayhem in the name of Islam. This has triggered intensive interest in inter-religious work, something dear to Wushishi. "The CCN coordinates development of individuals and provides emergency response programmes, promoting interfaith dialogue and consultations between Christians and Muslims," he says. CCN is a key partner of the WCC in the on-going process of developing an Inter-religious Monitoring Centre in Nigeria. "We say interfaith dialogue is not about winning souls, it is appreciating who you are," says the CCN leader, alluding to fears that collusion with Christians can lead to proselytizing. "Someone said to me, can you imagine what would happen if you were not talking? The interfaith peace centre is Abuja is a very welcome development." The centre's objective is to aid in national peace-building and reconciliation by seeking and storing evidence pertaining to religious conflict. Wushishi's voice rings with pride when he talks about how CCN has actively engaged in shaping the nation' future through political processes. "For the first time in its history, the CCN was actively involved in grass root election observation. This is to foster our strong belief that effective participation of Nigerians in the processes of governance is very important in shaping the nation's future. "The incessant loss of lives, poverty and multiple suffering of Nigerians can be curtailed if Nigerians take full responsibilities in electing their leaders." The churches also ran a voter registration campaign as Nigerians do not turn out in strong numbers, with only 43 percent of those registered turning out in the 2015 presidential poll. The victor was Muhammadu Buhari, who had once seized power in a military coup, but is now committed to the democratic process. "He was not elected by Muslims or Christians, he was elected by Nigerians," notes Wushishi who regrets that under the old administration the army was not paid or equipped to fight the scourge of Boko Haram. "Since the new man came to power," he adds, "We have seen a high level of commitment in the fight against Boko Haram." He continues, "We have also observed some positive changes. The political tension beaten by the drums of war in uncertainty and disintegration of Nigeria has become calmed after the elections." Wushishi praised an improvement in power supply and the government's "commitment to end the cancer corruption that has eaten deep into all sectors of our development". He also says, "in the agriculture sector we believe the government will create job opportunity, reduce hunger and combat poverty in the country," lessening its dependence on oil as the driver of the economy. But it is not only in the governmental sector that corruption is being tackled. Wushishi said, "Corruption is our ogre. We have to get people when they are young" if honest practices are to be instilled. He cited cheating in exams, noting, "When they are young they take small, but when they become older and leaders, they take all." The CCN has begun cleaning up some shoddy practices regarding the rental of its properties by creating a full inventory, and getting income to fund church projects, stopping a shady side economy for certain individuals.